​Book early and save $3,000 per person on Cabin Categories 1, 2, and 3. Book by Nov 30, 2017. Experience scenic, compelling Japan, visiting unique ports and rarely seen wilderness areas in luxury on board exclusively chartered 'L'Austral.' Listen to fascinating lectures from A&K's award-winning expedition team and choose from a variety of enriching experiences en route. reception and dinner with fellow guests, your A&K Expedition team and local guides who will be accompanying you and enriching your voyage. After breakfast at the hotel, embark on a guided walking tour of the temples in the surrounding Higashiyama Shichijo district. After lunch, transfer from Kyoto to Osaka, where you board luxurious ‘L’Austral,’ your luxurious floating home for the next 11 nights. culture. You may, for example, opt to travel to Naoshima Island by ferry for a full-day excursion, celebrating its architecture and art museums. Visit the breathtaking, hillside Chichu Art Museum and stop at Benesse House, a complex featuring unique work by Japanese and international artists. Alternately, board a high-speed boat to Shodoshima, or Shodo Island, the heart of Japan’s olive-growing industry for a full-day tour. Otherwise, you may remain on Shikoku Island, experiencing Takamatsu’s most acclaimed features. Begin with a visit to Ritsurin Park, one of Japan’s finest gardens. After taking in the pond, bridge and hill-stippled setting, attend a hands-on udon noodle-making demonstration to gain insight into this local culinary art. Spend the rest of the day at your own pace in the lovely port of Takamatsu, with time to explore the shops and enjoy the lively atmosphere. Return to the ship at leisure. floats and artifacts used in the annual Karatsu Kunchi autumn festival, recently inscribed on the UNESCO Intangible Cultural Heritage list. You may also visit Ningyo Joruri (puppet theater) and the Nakazato Taroemon Kiln, a ceramic studio that has been active since the late 16th century. Alternatively, visit the Kitahata Shige region to meet green tea farmers and to pick your own tea leaves. Disembark and spend a full day exploring Gyeongju, South Korea, ancient capital of the Shilla Dynasty and a UNESCO World Heritage Site. Gyeongju’s cultural heritage dates back to the first millennium, when it began a 1,000-year rule of Korea. Witness its excavated monuments, temples, tombs and pagodas, gaining insight from your cultural historian. Then, unearth the treasures of the National Museum, which houses an exceptional collection of gold jewelry, metal weapons and distinctive pottery. Sit down to a lunch of Korean delicacies, and witness a traditional dance performance. Return to Japan and disembark at Sakaiminato to visit Matsue, the “town of water,” nestled between a scenic lake and a large lagoon. Choose to explore the countryside, pausing at the Peonies Village to wander through its picturesque Yuushien Garden. Pause for lunch at a local restaurant before visiting historic Matsue Castle, one of Japan’s few remaining medieval castles, built in original wooden form. Alternately, visit the garden-frocked Adachi Museum of Art, which melds the founders’ passions for art and garden design. Following a traditional lunch at a ryokan (inn), visit Yakumo-mura village to learn about the art of Japanese paper-making. geisha performance at Higashi Chaia geisha district. At your leisure, wander through its Omicho Market, which features everything from fresh flowers to fish and local handicrafts. Later, partake in a tea ceremony and discover the sophisticated Kenroku-en Garden, known for its contemplative botanical designs. Or, choose a more active excursion that includes a hike in Kakusenkei Gorge; lunch at a local restaurant; and an onsen (spa) experience in the Yamanaka Onsen district, or a visit to scenic Shirakawa-go and the Shogawa River Valley. Travel off the beaten path and arrive at pastoral Sado Island, replete with rice paddies, bamboo groves and dramatic, surf-pounded seacoasts. Political exiles, deposed emperors and intellectuals were once “banished” to live in this beautiful setting. Today, enjoy an exclusive, private performance by the fabled Kodo Taiko drummers, an exhilarating experience followed by a rare opportunity to meet the world-famous troupe. 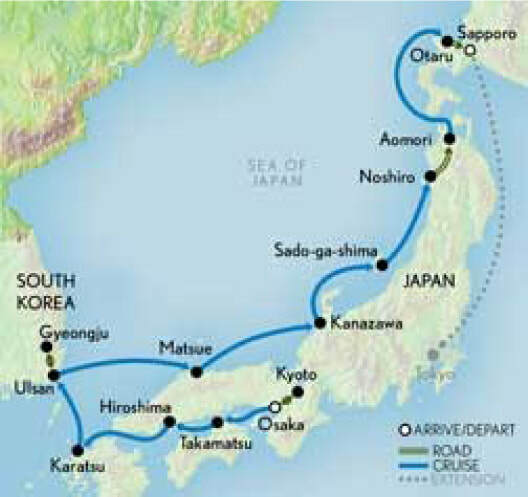 Return to your ship and set sail for the west coast of Japan’s mainland. experience, you may choose a trekking excursion to Juniko Lake alongside an A&K naturalist and a national park nature guide. Later this afternoon, reboard your vessel in Aomori. artwork on display. Afterward, discover Otaru’s storied glass-making and visit a sake distillery, where you may sample its rice wine. End with a visit to the city’s historic canal; once filled with fishing barges, it is now lined with museums and shops, which are situated in converted warehouses. Or, choose to visit Mount Tengu by gondola, taking in panoramic views of Otaru Port and Ishikari Bay. During a nature walk, you may see the 100-year-old cherry tree. Then, visit the Tengu House, where nearly 700 goblin masks from throughout Japan are exhibited. After your descent back to the city, partake in a hands-on glass-making workshop and head to see the famous canal. Spend the evening in port in Otaru. onward with your independent travels. Fly from Sapporo to Tokyo. Enjoy lunch at a local restaurant and check in to your hotel. Visit the Asakusa District and the Shunkaen Bonsai Museum or tour Tokyo, visiting Asakusa and the Edo Tokyo Museum with a glass-cutting experience. Join fellow guests for a farewell reception and dinner.